The Lumenier QAV-R FPV racing quadcopter airframe is a light weight, super stiff, finely tuned airframe designed for high performance FPV Drone Racing. The airframe implements 4mm thick removable arms and supports various arm sizes supporting 4", 5", and 6" propellers. Lumenier's QAV-R brand comprises a number of highly specialized components for the FPV Drone Racer. This newest version of the QAV-R features a stronger carbon fiber bottom plate and thicker 2mm top plate, giving you the best of both durability and performance. The Lumenier QAV-R quad deploys and improves the removable center X arm position made popular in pro pilot circles by the Alien racing quad and further refines the popular center section of the Lumenier QAV210/180 with a number of key innovations. To enable extremely fast arm changeovers in race pit settings, the QAV-R frame implements custom developed, precision machined aluminum mounting hardware. This hardware allows a pilot to remove an arm by removing 3 screws from the bottom of the airframe without the need to worry about holding nuts or other hardware on the inside of the airframe. One 2mm Allen tool is all that is needed to completely remove an arm within seconds. The custom aluminum hardware also stiffens the frame core and eliminates the need for captive nuts that would have to be press fit into the Carbon Fiber. No structural connection is made between the arm fasteners and the power distribution board to avoid shorts during severe crashes. The bare QAV-R frame kit weighs only 106g (with PDB, but no other electronics or motors), significantly lighter than the competition. Lumenier has a wide variety of accessories available for the QAV-R airframe. These accessories include a Quick Swap power distribution board, high quality carrying case, a super bright RGB LED board, vibration isolation HD camera mount, and more. 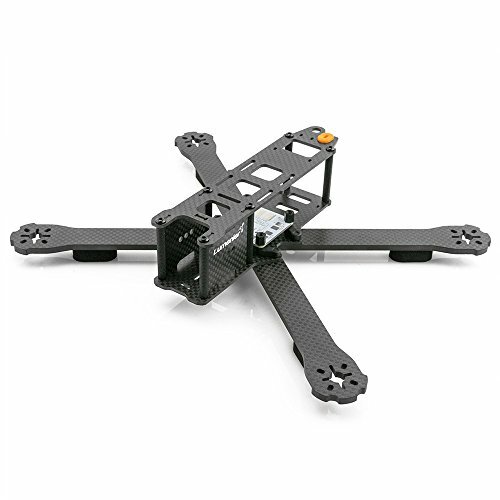 Full 3K Carbon Fiber airframe featuring a solid 2mm main plate and 4mm removable arms. Custom aluminum hardware to enable one tool, quick swapping of arms in race pit settings. Black Oxide steel screws. Easy grip anodized spacers. Comes with Lumenier 4Power power distribution board which can be fitted with an optional Pololu voltage drop-down circuit (to 12v or 5v), a XT60 pig-tail, and the silicone grommet holding method for the pig-tail introduced in the QAV210/180. Each QAV-R FPV racing quad kit comes complete with 4 arms sized to support either 4", 5", or 6" propellers. Support for 32mm board cams as well as 26mm cams in cases such as the Lumenier CM-650. Support to carry HD camera with optional camera mount. Airframe: 99g (airframe + hardware), 106 (with PDB). AUW: The QAV-R FPV Quadcopter is flown with an AUW of ~290g depending on motor choice (includes all flight electronics and FPV gear, but without Lipo or HD camera). If you have any questions about this product by Lumenier, contact us by completing and submitting the form below. If you are looking for a specif part number, please include it with your message.